If you are a pro videographer who is tired of having to reassemble your video rigs between locations, Think Tank Photo has just released seven new professional video gear options. In addition to being lighter weight and more features than traditional hard cases, the Video Rig Rollers enable you to hit the ground running by leaving your camera rigs fully assembled between shoots. For traveling videographers, the Video Transport Rollers allow you to carry on the maximum amount of gear on the plane with you. Finally, designed for everyday use, the three new Video Workhorse shoulder bags are your on-the-go toolbox for professional video. Don’t forget that by clicking our links to Think Tank, you receive a free accessory and free shipping with your orders of all of their gear. You can also pick them up at B&H Photo and Adorama. The new video bags range in size. The largest, the Video Rig 24 rolling case, holds a fully assembled 24” video rig and features inset channel aluminum tubing for added strength and durability. The mid-sized bag, the Video Transport 20, holds a video camera body, four to six lenses (detached), shotgun mic, small monitor, 4K recorder, audio recorder, additional accessories, and up to a 17” laptop in a padded sleeve. The smallest, the Video Workhorse 19 shoulder bag, holds a professional camcorder or video cameras up to 19” and features striated aluminum and arched twinwall reinforced struts to create a collapse-proof lid. 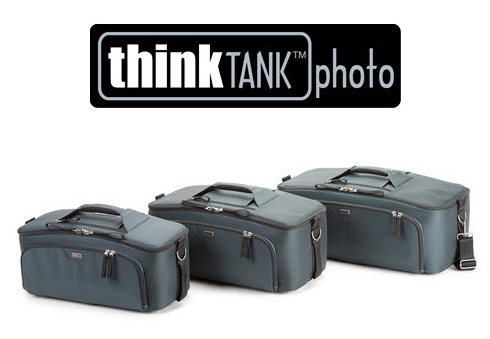 Built tough, with the quality Think Tank is known for, these bags are the perfect blend of protection and functionality. Video Workhorse 21―Fits a professional camcorder or video camera rig up to 21” (53.3cm) long and 8.7” (22cm) tall, which could include a camera body, lens, monitor, viewfinder, 4K recorder, audio recorder, medium LED lightpanel, shotgun mic, lavaliere mics, rails, follow-focus, matte-box, shoulder mount, top handle, and cables. The shoulder bag holds a Canon C-series, Sony FS700, FS5, FS7, F5 or F55, Red Epic/Scarlet, Black Magic Cinema Camera, Ursa or Ursa Mini, or a DSLR/Mirrorless rig such as the Sony a7sII, Panasonic GH4, or Canon 5DMIII.